Nuclear Industry China was held between March 28-31 in Beijing. This year showcased 214 exhibitors, 60% of them were Chinese manufacturer. I was first surprized by several characteristics: the size of the event (half of the previous one), the number of visitors (the hall was too often empty), the mood of the exhibitors (“let’s wait and hope for a new project”). 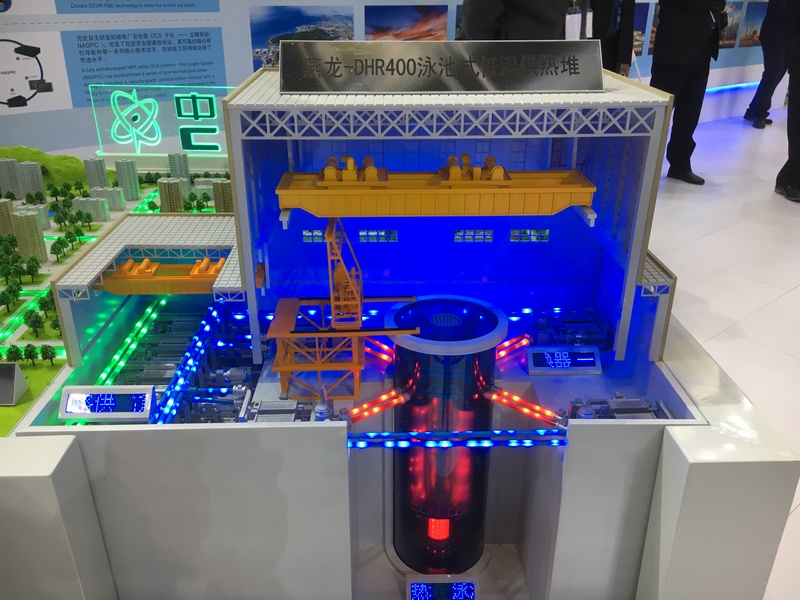 NIC exhibited several characteristics of the domestic industry, from the regional clustering (Haiyan, Haiyang, Sichuan, Heilongjiang, Shanghai), the showcase of new reactors such as the Hualong (from CNNC, from CGN and from the merger), the CAP1400, the HTGR, the TWR, the SMR (Linglong, ACP100), the Yanlong pool-type low-temperature heating reactor ( DHR-400) and several others, including the ITER project, to the involvement of new comers from the aerospace program in robotics for operation, maintenance and decommissioning. I was particularly impressed by the representatives from the industry. Not much double talk. From the manufacturer to the EPC, all questions found satisfying answers and moreover, the representative was competent, no more pretty and skinny model who gives a bag full of documents and telling you to call a number to have your information. On the foreign side, two countries led the market, the French with the largest pavilion, and the US, which illustrates the two technologies used in China, the Hualong and the CAP1000, result of technology transfer. Beside these two countries, Canada and Spain have notable representation, Rosatom reduce its presence and the rest of the world industry was quite insignificant. The Chinese industry is not going abroad yet, most of the companies follow CNNC, CGN and SNPCT. Therefore only Pakistan is an overseas reference. The Chinese companies want to export and ready to transfer technology to domestic companies in the Middle East and Africa. They all understand their need of localization. Foreign companies see their business in China either steady, either declining. Most of them are still optimist about this market and their advanced technology. A few companies fear the acquisition by China of foreign companies, and will compete in the higher segment of the market. What can we conclude from the NIC? Arnaud Lefevre is the Chief Executive Officer of Dynatom International. Founder of Dynabond Powertech Service, Arnaud is in charge of the international development of the business portfolio.